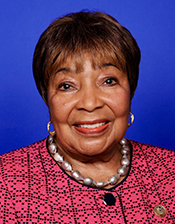 JOHNSON, Eddie Bernice, a Representative from Texas; born in Waco, McLennan County, Tex., December 3, 1935; graduated from A.J. Moore High School, Waco, Tex., 1952; nursing certificate, St. Mary’s College at the University of Notre Dame, Notre Dame, Ind., 1955; B.S., Texas Christian University, Fort Worth, Tex., 1967; M.P.A., Southern Methodist University, Dallas, Tex., 1976; chief psychiatric nurse and psychotherapist, Veterans Administration hospital, Dallas, Tex. ; member of the Texas state house of representatives, 1972-1977; administrator, United States Department of Health, Education and Welfare, 1977-1981; business owner; member of the Texas state senate, 1986-1992; elected as a Democrat to the One Hundred Third and to the thirteen succeeding Congresses (January 3, 1993-present); chair, Committee on Science, Space, and Technology (One Hundred Sixteenth Congress).